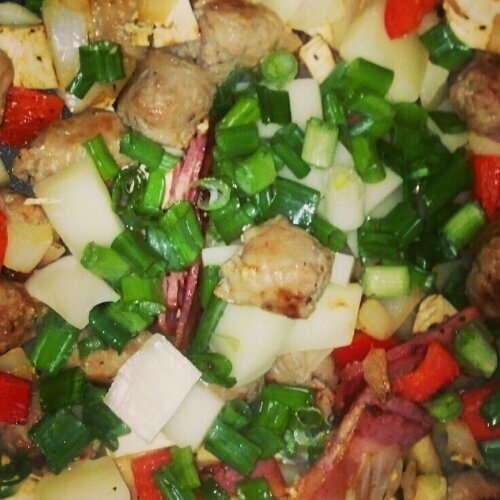 One of my favorite ways to get veggies in are to make a veggie and sausage scramble. You can really scramble anything up. Use more traditional breakfast veggies such as peppers, onions, and mushrooms for breakfast or mix it up and use more savory veggies like broccoli to make a scramble for breakfast for dinner! Don’t forget spices when cooking eggs for a restaurant caliber breakfast at home! Chop meats into bite size pieces. Start sauteing over medium low heat. Chop veggies. Add to pan. Add egg to pan scrambling as the eggs cook. Cook for about 3-5 min or until eggs are desired firmness.